I'm sure I would be confused - lol, but this looks great. I'm curious to see the finish!! It's definitely coming together. I like the color combination. You are so smart Nancy!! have you thought of running a mystery yourself? X marks the spot? Lovely. Very pretty - especially with that rich gold background. Just as you finish a mystery project I'll be starting one. Our new Saturday Sampler is a mystery. Looking forward to it. Progress. Hum is it an Irish chain? Only time will tell. I'm thinking of doing the mystery at Meadows something or other blog that starts in July. One clue a month -- very doable for me although I'll probably get behind if I try it! I love this color combination. Makes me think of berries at the farmer's market. random I know. I love following the clues with you. I'm wild about these squares. I can't wait to see the finished quilt! 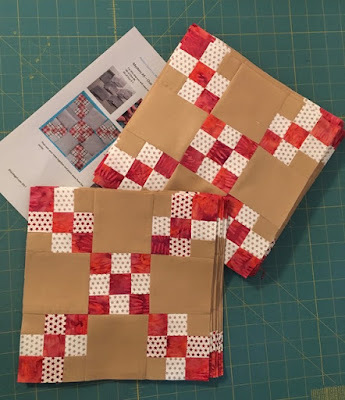 I am just getting into quilting and learning all the things I need to know. Your quilting is amazing. I even sketch some of the squares for that moment when I say, "I wonder how I could do that." It's looking great! I am so impressed by your precise sewing.